Fire is one of man’s oldest tools. It is also one of his oldest weapons. In considering your preps, you need to take in to consideration how to suppress an out of control fire made by yourself or someone else. An out of control fire can destroy your home with all your preps, your car, and even you. And fire extinguishers should be part of your preps. Here are just some examples of needing a fire extinguisher in a SHTF situation. It’s grid down and you are cooking with a flame device and something catches fire. It’s grid down and the wind blows over a candle or an oil lamp starting a fire. You are bugging out and a small fuel leak catches your engine on fire. You are bugging in and your angry non-prepped neighbors decide to burn you out because you won’t give them anything and you need to either suppress the fire or escape. There are different classifications of fire extinguishers based on the type of fire they are designed to put out. The following chart shows the classifications as they apply to the United States. The UK, Europe, and other parts of the world use different classifications symbols and markings but the concepts are similar. 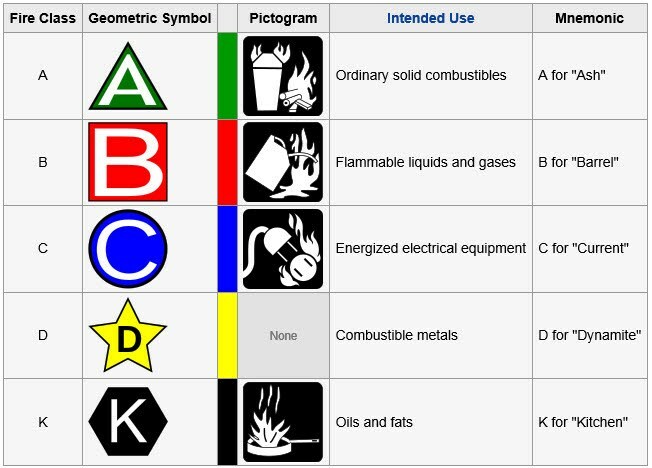 As you can see from the chart, there are five basic types of extinguishers. They will also come in different sizes. Some are also designed to suppress multiple types of fires. This is typically your ABC rated extinguisher. This is also the type that you would typically want in your home for general protection. They generally come in 5 or 10 pound sizes. These are filled with foam or powder and pressurized with nitrogen. 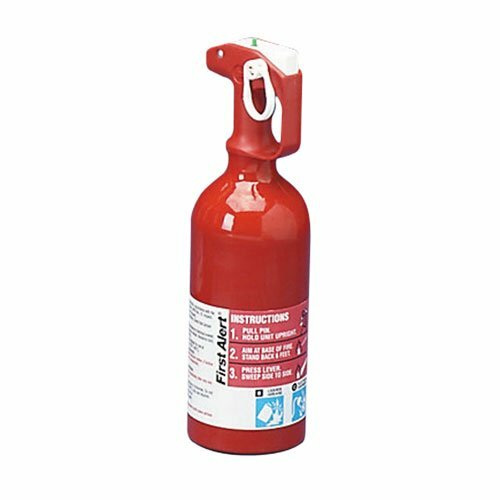 Smaller fire extinguishers are typically used for the kitchen or for vehicle use. 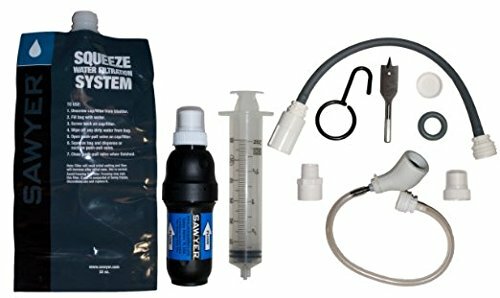 Another type of fire extinguisher that you might find useful for prepping, especially bugging out into the wilderness is the old style manual water pump style. It will only deal with class A type combustibles (wood, cloth etc.) but the advantage is that it is easily refillable from a stream or lake. In addition to have enough of the right type of fire extinguisher, there is some other equipment you may wish to consider. could be a lifesaver. Having a purpose designed fire escape ladder could be very important. One of the disadvantages of commercial fire extinguishers for long-term SHTF situation is the issue of refilling them. Except for the water pump type, these could be a case of fire and forget (excuse the pun). But having that initial ability to put out a fire could be critically important. For long-term bug in situations, you may want to consider having buckets of sand strategically located on your property. Many people will buy fire extinguishers without really learning how to properly use them. The illustration shows the proper method of PASS. 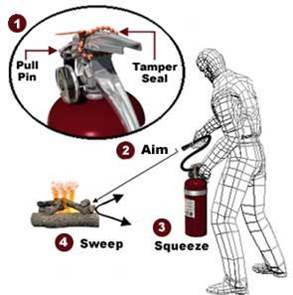 Pull the pin, Aim low at the base of the fire, Squeeze the handle and Sweep from side to side. Being able to start a fire is a basic survival technique. Knowing how to put one out can be just as important. Too many people think that an extinguisher makes you safe and able to fight a fire. For the most part that’s stupid thinking which can kill you from just inhaling toxic smoke while playing at fireman. They also SERIOUSLY underestimate the time they have to do something. Take a look at the standard manufacturer discharge times for various types of fire extinguisher. Does 20 seconds seem like a long time? It works out as about the time you’ll take to read this line FOUR times. If that’s not enough to discourage you, try and fit anything from 15 seconds and over into your GOOD / BOB / GO bag. Bit heavy eh? However a fire blanket weighs in at around a kilo. Last fire course I attended gave some good sobering advice to us all. Is it bigger than a waste paper bin? If yes, get low (heat and smoke rises) and G-T-F out! Stuff can be replaced, you can’t! Hows about you on fire! Drop and roll, hopefully with someone smothering the fire with a blanket.